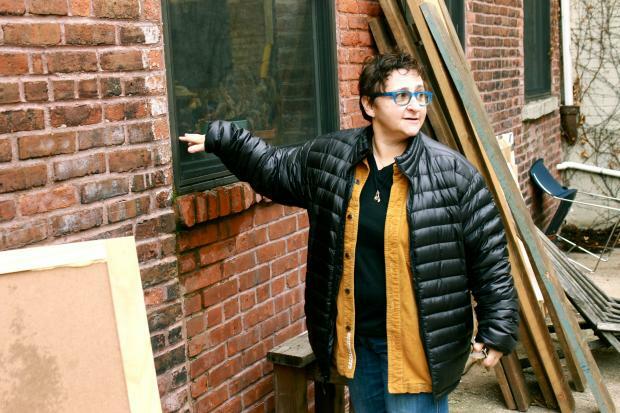 CARROLL GARDENS — When Brooklyn curator Sarah Schmerler couldn’t convince the Brooklyn Museum to hold an exhibit dedicated to Red Hook artists who were affected by Sandy, she took matters into her own hands. She launched a mini exhibit called “Flood Line,” showing the works of artists who lost their equipment and artwork when their studios flooded during the storm. Outside of the gallery, she posted a sign criticizing the museum for ignoring Red Hook artists and for not showing their work after the storm. "Why didn't the Brooklyn Museum put on a show dedicated to artists whose studios were affected by Sandy?" the sign reads. Schmerler said it wasn't fair that the museum asked Red Hook artists to open their studios during the GO Brooklyn event in September, but then ignored them when they needed help most. Red Hook artists Sheila Goloborotko and John Perry nearly lost everything during Sandy, and they only had phone and Internet restored to their studios last week, Schmerler said. Now, their works are showing in a small window-box gallery called Gallery Untitled, located on Hicks Street between Union and President streets. Schmerler painted a line inside the gallery to show how high the floodwater rose in Red Hook during Sandy. The line hovers 39 inches off the ground. "Seeing the line inside with the work makes it crystal clear," Schmerler said. "Anyone would be pretty shocked if they had valuable artworks so close to, or under, that much toxic goo!" Both Goloborotko and Perry work out of studios located at 248 Creamer St. — home to at least a dozen studios, all of which were affected by Sandy. Puppet-makers, welders, sculptors, and mixed media artists all work out of studios on Creamer Street, Goloborotko said. “Most of my expensive equipment was underwater along with my handmade paper,” she said. “My open studio was a place that people could come to do their work on a regular basis for the past 25 years. Goloborotko said the cost of total damage to her studio was worth more than $25,000, and she has yet to raise enough money to replace most of her printing equipment. The Brooklyn Museum said that it had no plans of showing an exhibit dedicated to artists who were affected by Sandy, though they have held several fundraising events for Sandy victims in general. "Flood Line" will be on display at Gallery Unititled until Jan. 30.